You can hear the whistle blow! 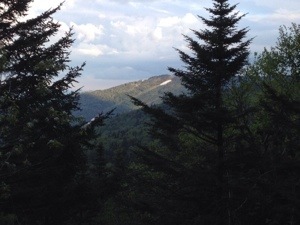 Pico Camp, Vt. AT NOBO mile 1693.2, Thursday June 5, 2014 — Under 500 miles left to go! You can almost hear the whistle. As the trail gods would have it, no sooner did I pass the 500 mile sign – not even 20 steps – than the Kingston Trio began singing “500 Miles” in yet another episode of iPod serendipity! It’s hard to believe, but the iPod seems totally in synch with the hike. As I’ve noted several times previously. This is no time to become over confident. The most challenging states are yet to come. 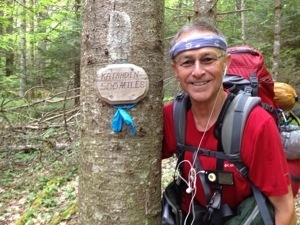 Plenty of thru hikers have bitten the dust in New Hampshire and Maine just a few miles short of their goals. That led to two Colorado style stream crossings because the bridges were washed out. 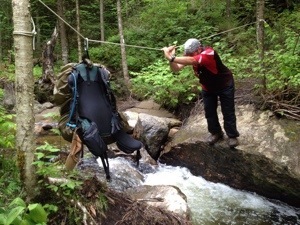 This is good practice for Maine where there are no bridges. 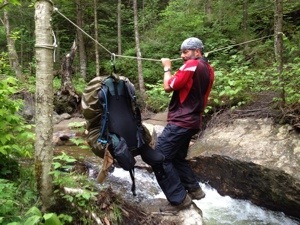 Warren, aka Swayed, made a video of me inching along a tree trunk which I’ll try to post when I have WIFI tomorrow. Tonight we’re on the old AT before it was rerouted for highway safety. It leads directly to the Inn at Long Trail where we’re headed in the morning. 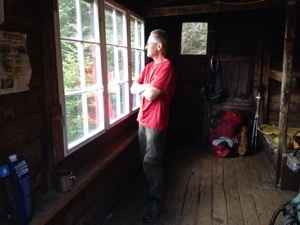 Our digs remind me of a trapper’s line shack from yesteryear from which we have a beautiful view of the Killington ski area. Thanks. Glad to have you along for the ride. I’ve read stuff from. Thanks for posting when you’ve got the opportunity, Guess I will just book mark this page.